These two videos serve as an introduction to the Downscaled Climate and Hydrology Projections website. This website, the result of a collaboration between several federal and non-federal partners, provides access to downscaled climate and hydrology projections for the contiguous United States and parts of Canada and Mexico, derived from contemporary global climate models. In the first video, Dr. Subhrendu Gangopadhyay, hydrologic engineer at the Bureau of Reclamation's Technical Service Center in Denver, introduces the website and provides an overview of the MetEd lesson Preparing Hydro-climate Inputs for Climate Change in Water Resources Planning. 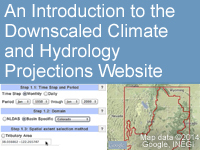 This lesson provides necessary background information needed to use the projections site effectively to retrieve climate and hydrology projections data for impacts analysis. In the second video, Dr. Gangopadhyay steps through the process of retrieving projections data using the website. This resource, produced in cooperation between the Bureau of Reclamation and The COMET® Program, is hosted on COMET's YouTube Channel. Downscaling is an important concept. An easy module to do.